Staffordshire’s finest will be in action in March as BCB Promotions host a night of professional boxing at King’s Hall, Stoke-On-Trent. 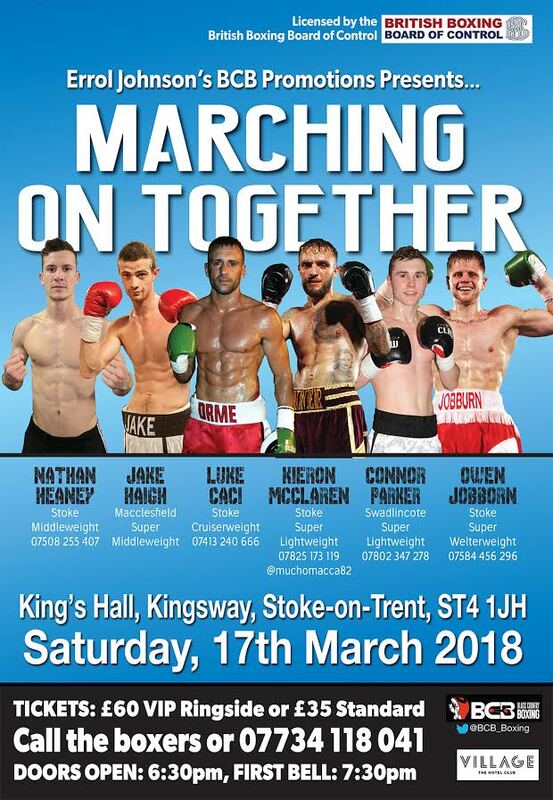 ‘Marching On Together’ – on Saturday, 17th March – features unbeaten Stoke quartet Luke Caci, Kieron McLaren, Nathan Heaney and Owen Jobburn plus unbeaten duo –Swadlincote’s Connor Parker and Macclesfield’s Jake Haigh. Cruiserweight Caci is will fight for an International Challenge Belt as he looks to build on an impressive debut year. The 28 year-old recorded four victories in 2017 and is on the title hunt in 2018. Super lightweight McLaren has accumulated eleven pro wins to date and will be looking to push on in 2018 and stake a claim for a shot at a Midlands Area Title. Super welterweight Jobburn has four pro wins to date plus a draw against fellow prospect, Sam Evans, last time out. Jobburn, who wants the rematch against Evans in 2018, is eager to showcase his skills in his hometown. Middleweight Heaney impressed on his pro debut in December as he looks to emulate a successful amateur career in the paid ranks. Swadlincote super lightweight, Parker, fought on the same card as Heaney in December as he cruised to 6-0 12 months after making his professional debut. Much is expected of the baby-faced assassin in 2018. Ricky-Hatton trained ‘High Tower’ Haigh stands at 6’ 3” and has accumulated seven professional wins in the super middleweight division to date. Tickets are priced at £35 for standard unreserved tickets or £60 VIP Ringside. They are available by calling the boxer direct or 07734 118 041.
Who are the most avoided boxers at the moment?